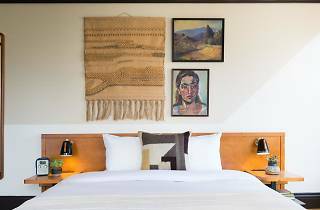 Catering to a hip international crowd, this buzzy hotel lives up to its hype with homey accommodations, killer cuisine and shared dorms to ensure that even true bohemians can get a room. Located in the heart of downtown LA’s financial district, this relatively new boutique hotel gives Downtown’s more established hip hotels some serious competition. The Freehand’s lobby is done up in a cheeky ‘70s palette of mustard and violet, complimented by rustic wooden furniture. Inside the rooms you’ll find that same updated boho aesthetic, with bespoke details like woven wall hangings, stacks of art books and wallpaper crafted from vintage maps of the city. The Freehand also offers four dining options, including a tea room, an Israeli-California fusion restaurant and the standout rooftop Broken Shaker bar. This poolside watering hole has cabana-meets- tiki vibes and serves up contemporary cocktails and light snacks like house-made tortilla chips with guacamole and peanut salsa. The pool itself is laden with millennial-friendly inflatables and offers a surprisingly relaxed experience; while the bar attracts twenty-somethings from across the city, the pool is open to hotel guests only. What makes the Freehand truly special, though, is that to stay there, you don’t have to break the bank: dorm-style shared rooms can house four, six, or eight travelers for a fraction of the price of a suite. Bonus: given the cool factor of the Freehand’s crowd, your bunkmate just might be your next adventure partner. Location: Bars, shops, restaurants and galleries are all within walking distance of the Freehand’s Downtown LA location; if you can’t find what you need nearby, the metro will take transport you to a variety of LA hot spots from Pasadena to the Santa Monica Pier. California Flower Mall: The heart of the nearby Flower District is 45,000 square feet of fresh cut flowers. While the Mall is technically a wholesale marketplace, admission is free for all visitors, and a dizzying array of divinely scented flora, elaborately crafted party arrangements, and friendly resident cats make for an ideal morning for kids and adults alike. Clifton’s Republic: The multi-story restaurant is home to several distinctly themed bars (think Old Hollywood, Tiki, and more), countless taxidermy wildlife displays, and the best Jell-O in the city. The Last Bookstore: This former bank building is offers a stunning array of discount used books and records, as well as an Instagram-worthy mezzanine with artfully sculpted book structures. 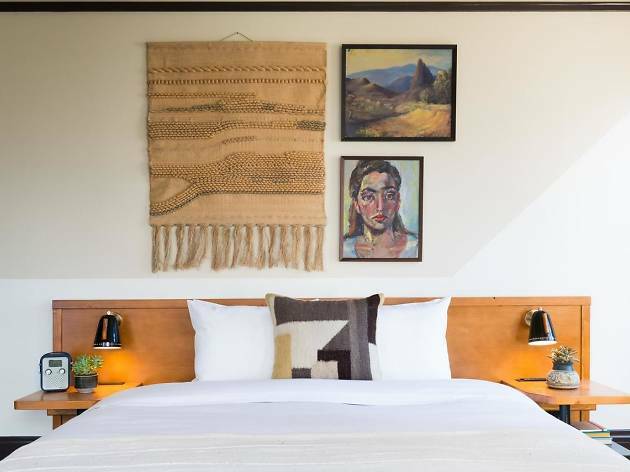 Good for: The Freehand’s shared rooms are a boon for students and other budget travelers; the hip digs and prime location for club- and gallery-goers also makes this spot perfect for young adventurers exploring Downtown and east LA. Time Out tip: Don’t sleep on Flowerboy, the Freehand’s gift shop. In lieu of the usual dad caps and license plate keychains, this boutique offers fresh cut floral arrangements, art objects, vintage clothing and more. Even if you can’t fit a succulent into your carry-on, you’re sure to find a unique souvenir. Now taking reservations for April with preview rate specials. Housed in the historic Commercial Exchange building, our hotel is truly one-of-a-kind, featuring suites, premium hotel rooms and shared accommodations with interiors designed by Roman & Williams. We’re taking it up a notch in LA, offering upgraded amenities including enhanced bedding, room service, convenient valet and attentive bellman ready to give you a hand.